Showing items in category Br Occupation of Former Italian Colonies., sorted by newest listed first. Search within Br Occupation of Former Italian Colonies. B.O.F.I.C. (MEF) - 1942 1d scarlet mint block of six 'ROUND/SQUARE' stops. 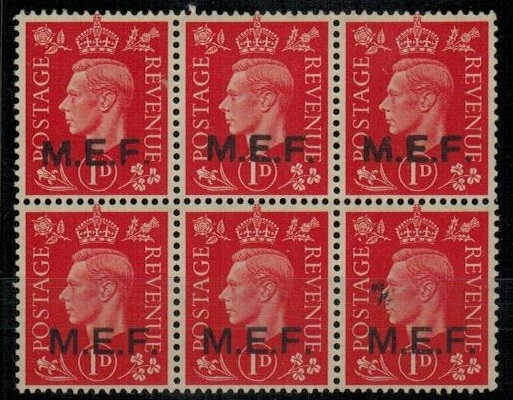 1942 1d scarlet fine mint block of six mounted on the top centre stamp only and showing the rare ROUND STOPS/SQUARE STOPS in vertical se-tenant pairs. 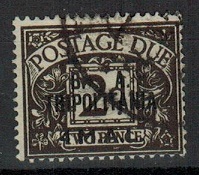 One stamp with black printing smudge. A nice piece. SG M6b. 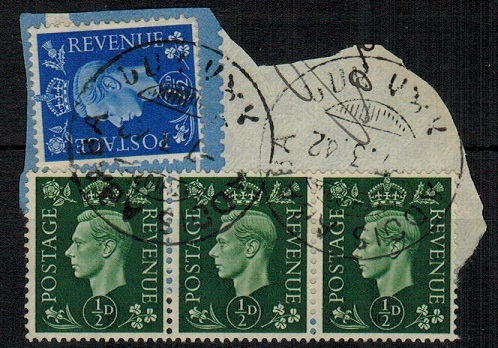 1948 1l on 1/2d emerald 'Postage Due' in a very fine unmounted mint pair with one stamp showing the MISSING STOP AFTER A. Complete with David Brandon certificate. SG TD1a. B.O.F.I.C. (Tripolitania) - 1948 2l on 1d 'Postage Due' U/M with MISSING STOP. SG TD2a. 1948 2l on 1d carmine 'Postage Due' in a very fine unmounted mint marginal pair with one stamp showing the MISSING STOP AFTER A. SG TD2a. B.O.F.I.C. 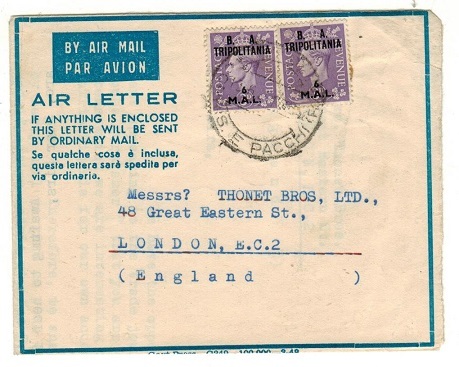 (Tripolitania) - 1948 air letter genuinely used to UK. 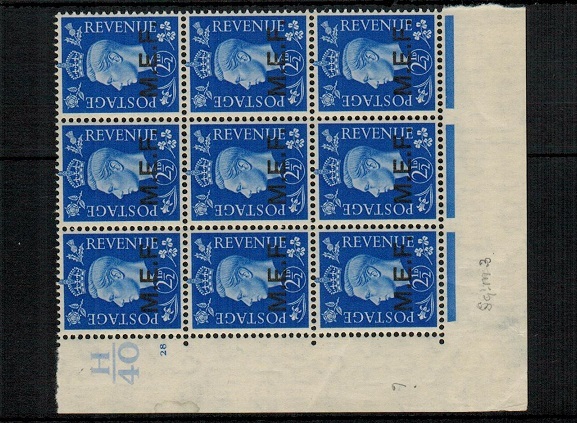 1948 blue on cream AIR LETTER imprinted 'Govt. Press-G349-100,000-3-48' at bottom addressed to UK and bearing 6 mail pair making up the 12 mal rate and cancelled by TRIPOLI/CORR.E.PACCHI cancel dated 13.6.1950. This being a scarce genuine use of this first air letter type printed at the Government Press in Tripolitania. A genuine use with full message. B.O.F.I.C. 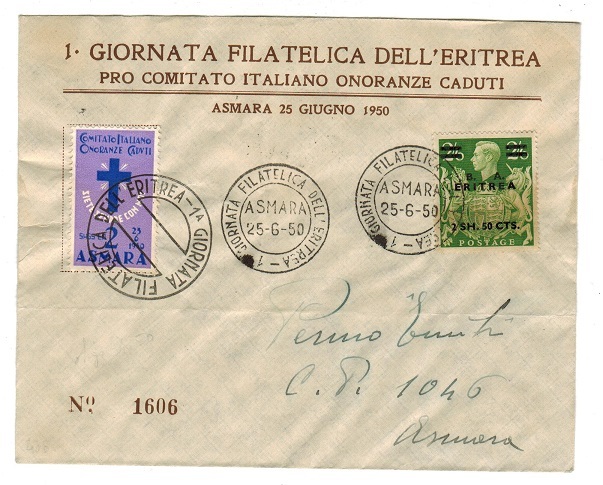 (Eritrea) - 1947 'ASMARA/ OFFICIAL PAID' cover to USA. 1947 (9.12.) 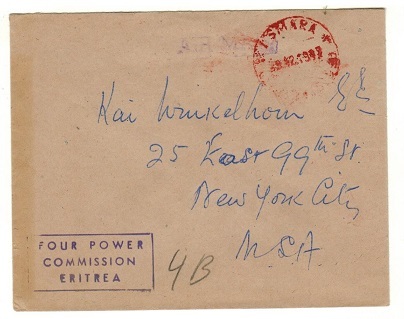 stampless cover addressed to USA handstamped at lower left by violet boxed FOUR POWER/COMMISSION/ERITREA h/s and struck by the very rare ASMARA/OFFICIAL PAID h/s. The 4 power commission was formed following the German defeat. B.O.F.I.C. 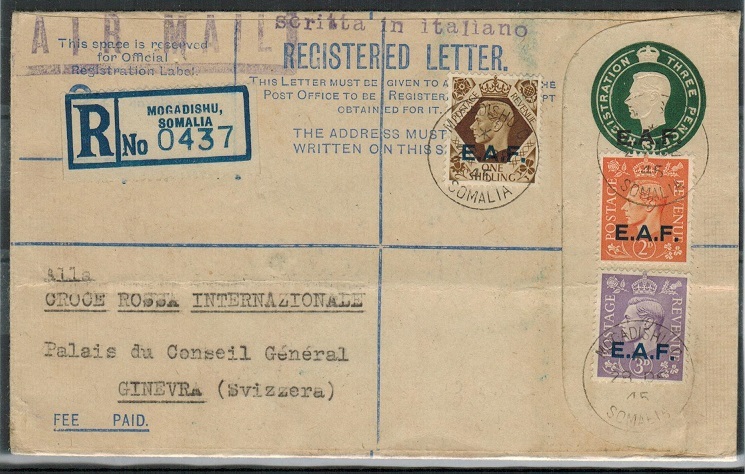 (Somalia) - 1939 3d green 'EAF' RPSE (flap fault) uprated to Italy. 1939 3d green 'Military & Occupation' 'KGVI' GB registered postal stationery envelope (size F) overprinted 'E.A.F.' 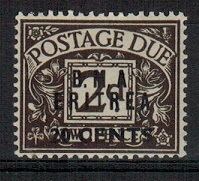 in black with 'Compensation' on reverse with FEE PAID on front and with '£5' corrected with large straight '2' h/s alongside. 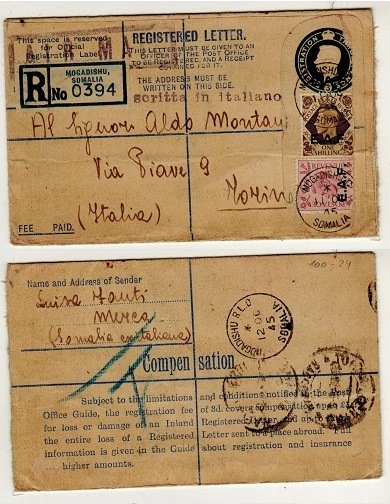 The envelope is addressed to Italy and has EAF 6d and 1/- adhesives added and tied by scarce MOGADISHU/SOMALIA cds's. Part of the flap has been unfortuntely torn away from rough opening on front causing damage to both stamps. A very scarce use of this GB military envelope in Somalia never the less of this elusive 'F' size. B.O.F.I.C. 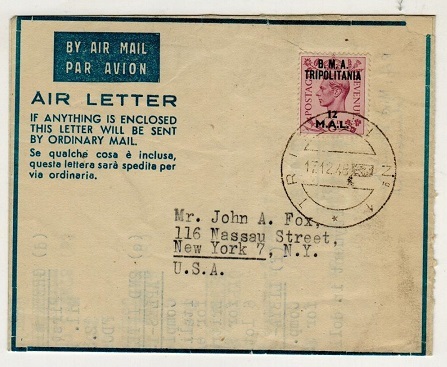 (Tripolitania) - 1948 12m on 6d rate FORMULA air letter to USA. 1948 (17.12.) use of blue on cream 'FORMULA' air letter addressed to USA bearing 12mal on 6d adhesive tied by TRIPOLI/NO.1 cds. Govt.Press-G349-100,000-3.48' imprint. A scarce genuine use with long message. B.O.F.I.C. (Tripolitania) - 1946 5d rate 'BMA/T/1 - OPENED BY CENSOR' cover to USA. 1946 (2.12.) 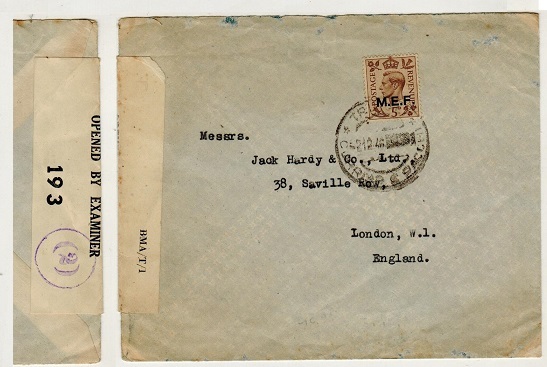 cover addressed to UK bearing 5d 'MEF' adhesive tied by TRIPOLI/CORRIS PACCHI cds with scarce 'BMA/T/1 - OPENED BY EXAMINER 193' label at left and cancelled on reverse side by '2' violet censor mark. B.O.F.I.C. (MEF) - 1942 1d to 5d 'dark colour' MEF set mint handstamped SPECIMEN. SG M1-M5. 1942 1d to 5d in fine mint condition each handsatmped SPECIMEN in black capital lettering. Unrecorded by SG. Very scarce. SG M1-M5. B.O.F.I.C. 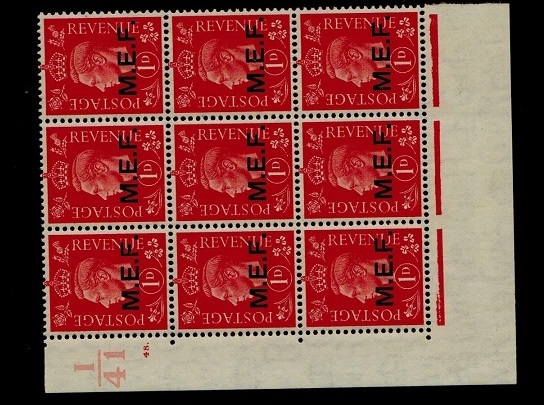 (MEF) - 1942 1d scarlet 'I41/Plate 48' mint block of nine. SG M1. 1942 1d scarlet mint block of nine mounted on the top stamps and lower salvage showing the I/41 plate 48 stop control in left margin. 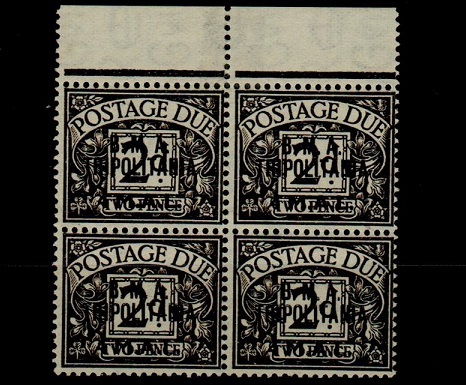 These stamps are rare in controls and with margins attached. Unlisted with this control according to GBOS handbook. SG M1. B.O.F.I.C. 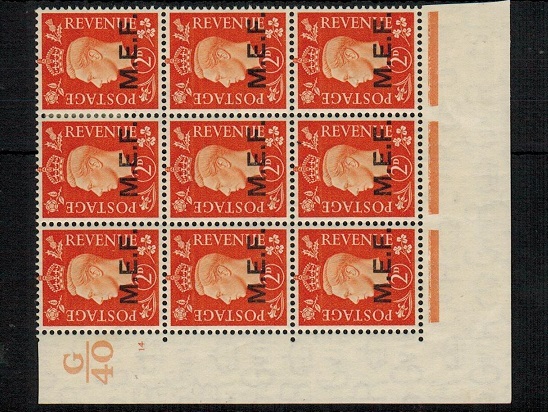 (MEF) - 1942 2d orange 'G40/Plate 14' mint block of nine. SG M2. 1942 2d orange mint block of nine mounted on the top stamps and lower salvage showing the G/40 plate 14 control in left margin. These stamps are rare in controls and with margins attached. SG M2. B.O.F.I.C. (MEF) - 1942 2 1/2d ultramarine 'H40/Plate 28' mint block of nine. SG M3. 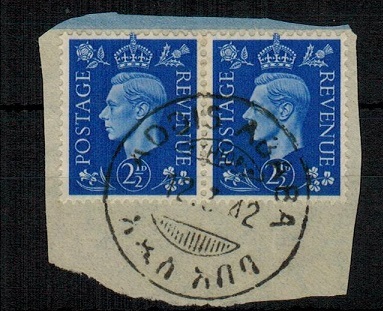 1942 2 1/2d ultramarine mint block of nine mounted on the top stamps and lower salvage showing the H/40 plate 28 control in left margin. These stamps are rare in controls and with margins attached. SG M3. B.O.F.I.C. 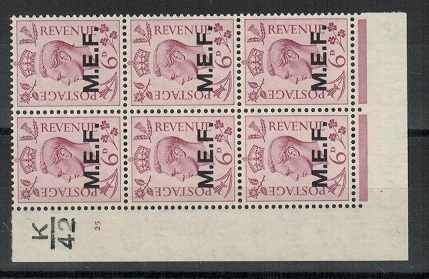 (MEF) - 1942 3d violet 'G40/Plate 18' mint block of nine. SG M4. 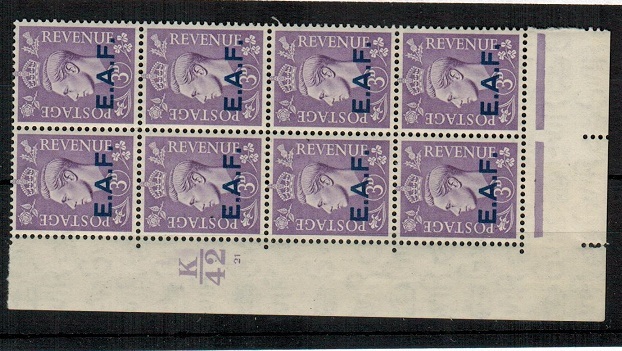 1942 3d violet mint block of nine mounted on the top stamps and lower salvage showing the G/40 plate 18 control in left margin. These stamps are rare in controls and with margins attached. SG M4. B.O.F.I.C. 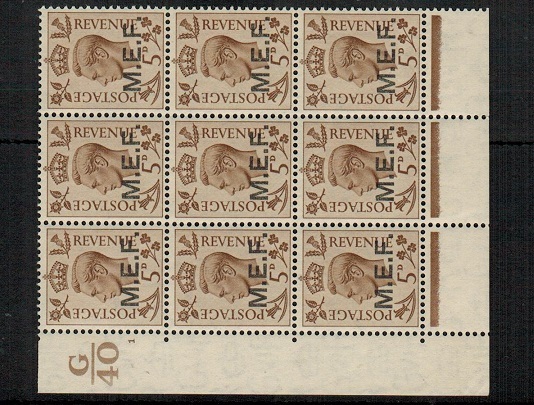 (MEF) - 1942 5d brown 'G40/Plate 1' mint block of nine. SG M5. 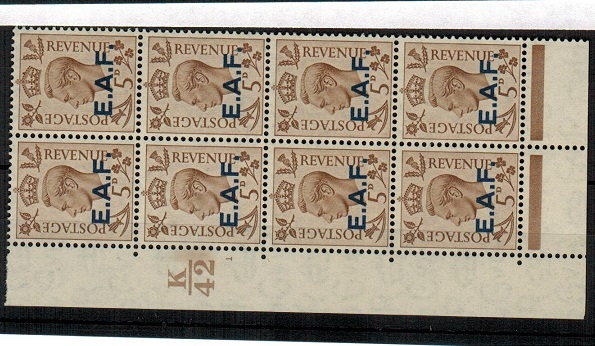 1942 5d brown mint block of nine mounted on the top stamps and lower salvage showing the G/40 plate 1 control in left margin. These stamps are rare in controls and with margins attached. SG M5. B.O.F.I.C. (Somalia) 1943 5d rate 'PASSED/ YY/...' censor cover to Uganda used at MOGADISCIO. 1943 (19.2.) 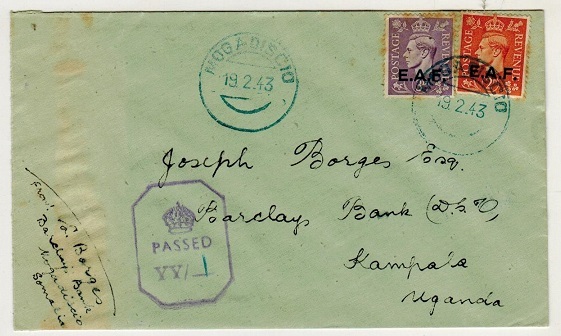 cover addressed to Uganda bearing 'GB' 2d and 3d adhesives each overprinted 'E.A.F.' and cancelled by MOGADISIO cds struck in 'blue' ink with violet crowned octagonal PASSED/ YY/… censor handstamp at left with '1' inserted in blue crayon. B.O.F.I.C. 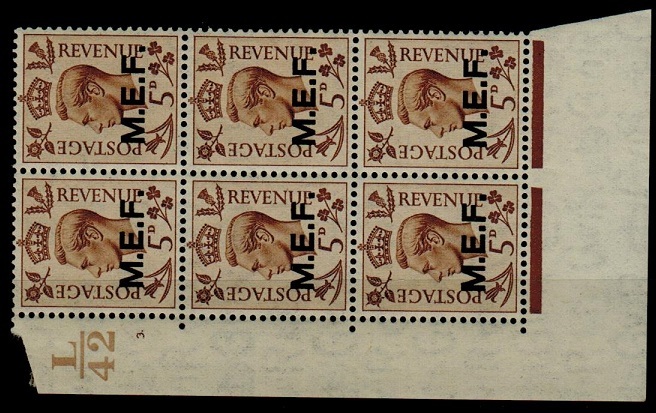 (MEF) - 1943 1d pale scarlet fine mint 'L/42' plate block of eight. SG M11. 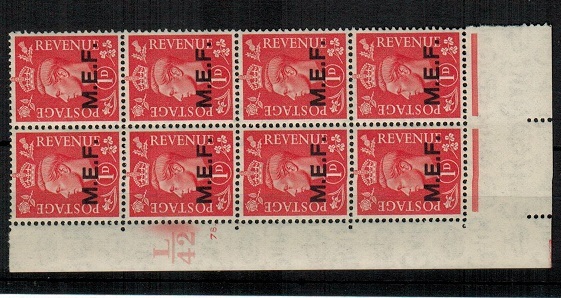 1943 1d pale scarlet in a fine mint corner marginal block of eight showing L/42 Plate 78 dot. SG M11. B.O.F.I.C. 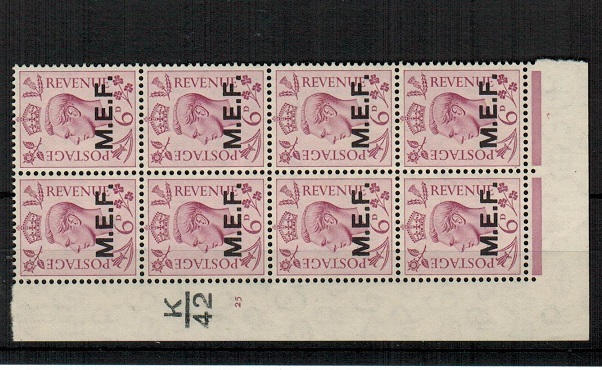 (MEF) - 1943 6d purple fine mint 'K/42' plate block of eight. SG M16. 1943 6d purple in a fine mint corner marginal block of eight showing K/42 Plate 25 no dot. SG M16. B.O.F.I.C. 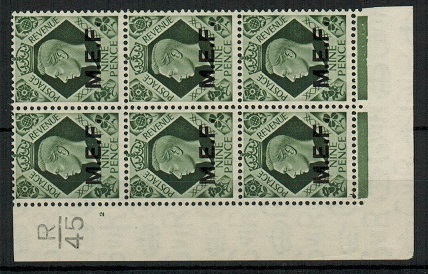 (MEF) - 1943 9d deep olive green fine mint 'K/42' plate block of six. SG M17. 1943 9d deep olive green in a fine mint corner marginal block of eight showing K/42 Plate 2 no dot. SG M17. 1943 1/- bistre-brown in a fine mint corner marginal block of eight showing K/42 Plate 6 no dot. SG M18. B.O.F.I.C. (Tripolitania) - 1943 local cover used at SABRATHA with 'red' ink. 1943 (29.6.) locally addressed cover to the British General Hospital bearing light coloured 1d-5d 'MEF' adhesives tied by two strikes of the rare SABRATHA/TRIPOLI cds struck in red ink. GBOS type T29. B.O.F.I.C. (MEF) - 1942 1/2d emerald 'Postage Due' mint 'G 40' control block of four. SG MD1. 1942 1/2d emerald 'Postage Due' in a fine 'G 40' mint control block of four. SG MD1. B.O.F.I.C. (MEF) - 1942 2d agate 'Postage Due' in a mint 'K 42' control block of four. SG MD3. 1942 2d agate 'Postage Due' in a fine 'GK 42' mint control block of four. Small toned perf at top. SG MD3. B.O.F.I.C. 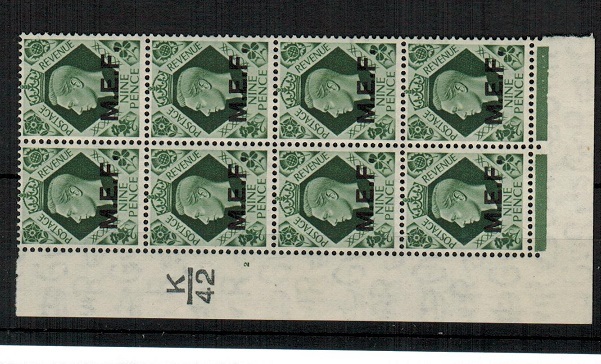 (MEF) - 1942 3d violet 'Postage Due' in a mint 'K 42' control block of four. SG MD4. 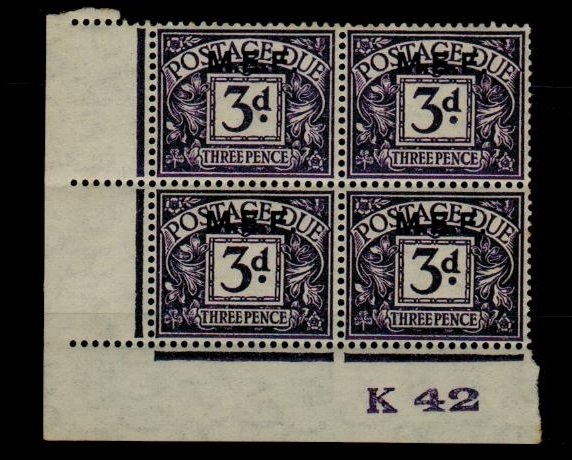 1942 3d violet 'Postage Due' in a fine 'G 40' mint control block of four. SG MD4. B.O.F.I.C. (Dodecanese) - 1945 unpaid 1/- (MEF) local 'Postage Due' cover used at LINDO. 1945 (31.12.) 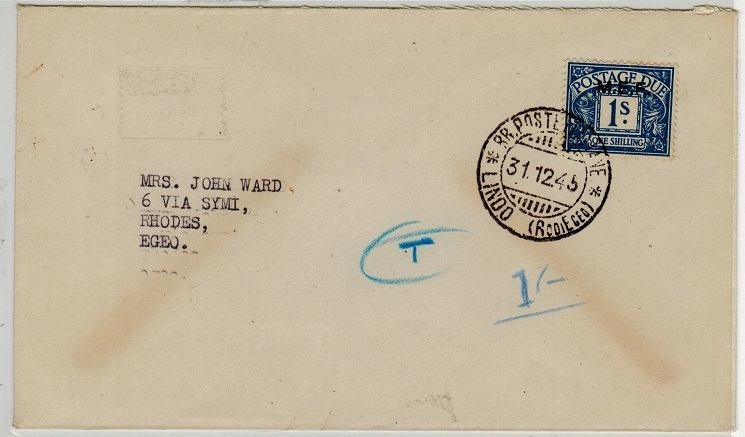 cover addressed locally to Rhodes marked 'T' and '1/-' in blue manuscript with 1/- MEF 'Postage Due' added (SG MD5) and tied by LINDO (RODI EGEO) cds. B.O.F.I.C. (Somalia) - 1943 1d scarlet 'K/42 plate 75' mint control block of eight. SG S1. 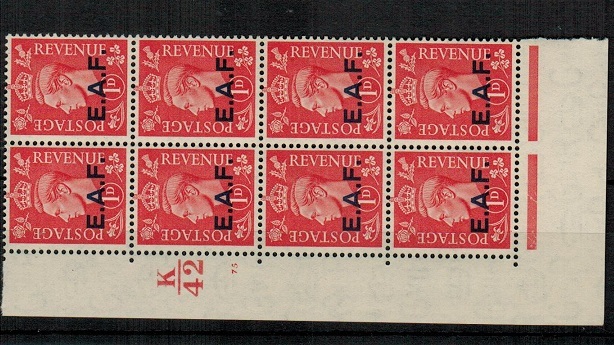 1943 1d pale scarlet in a fine mint corner marginal block of eight showing K/42 Plate 75 no dot. SG S1. B.O.F.I.C. (Somalia) - 1943 2 1/2d ultramarine 'K/42 plate 90' mint control blk of eight. SG S3. 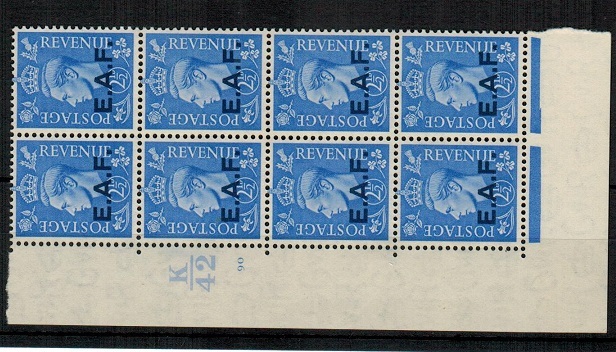 1943 2 1/2d light ultramarine in a fine mint corner marginal block of eight showing K/42 Plate 90 no dot. SG S3. B.O.F.I.C. (Somalia) - 1943 3d pale violet 'K/42 plate 21' mint control block of eight. SG S4. 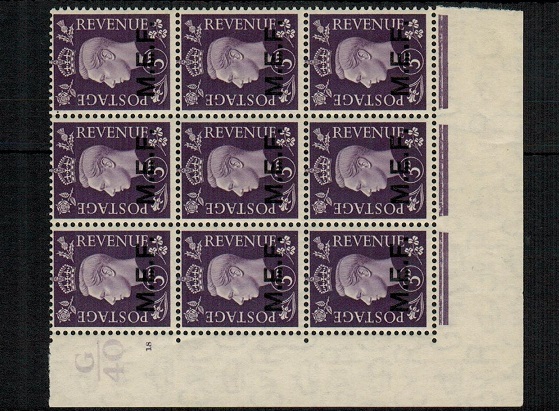 1943 3d pale violet in a fine mint corner marginal block of eight showing K/42 Plate 21 no dot. SG S4. B.O.F.I.C. (Somalia) - 1943 5d brown 'K/42 plate 1' mint control block of eight. SG S5. 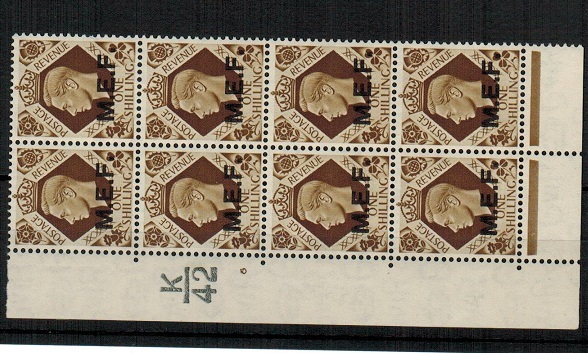 1943 5d brown in a fine mint corner marginal block of eight showing K/42 Plate 1 no dot. SG S5. B.O.F.I.C. (Cyrenaica) - 1949 8d rate cover to the French Zone in Germany used at BENGHAZI. 1949 (7.6.) 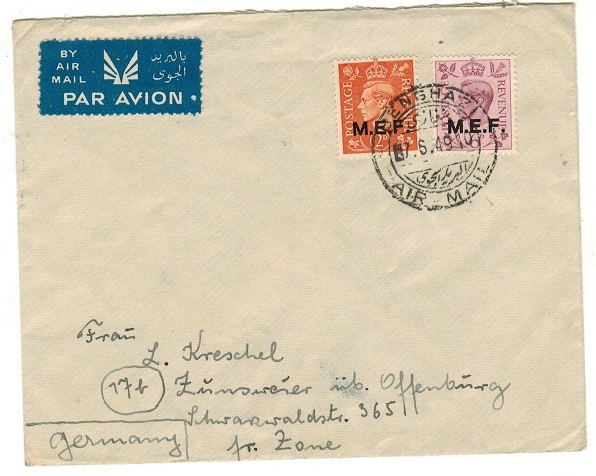 cover addressed to the French Zone in Germany bearing MEF 2d and 6d adhesives tied by BENGHAZI/AIR MAIL cds. A scarcer use at the foreign letter rate (20 grams) 5d and additional (20 grams) 3d. External mail rate. B.O.F.I.C. (Cyrenaica) - 1949 10d rate internal air cover used at BENGHAZI. 1949 (NOV.12.) cover addressed to Asmara bearing MEF 5d adhesive pair tied by light BENGHAZI/AIRMAIL cds. A 10d rate. B.O.F.I.C. (Cyrenaica) - 1947 commercial 8d rate cover to UK. 1947 (1.12.) 'Elie Barda' commercial cover addressed to UK bearing MEF 3d and 5d adhesives tied by smudgy BENGHAZI/AIR MAIL cds. B.O.F.I.C. (Cyrenaica) - 1946 commercial 1/3d rate cover to Egypt used at BENGHAZI. 1946 (JUL.8.) 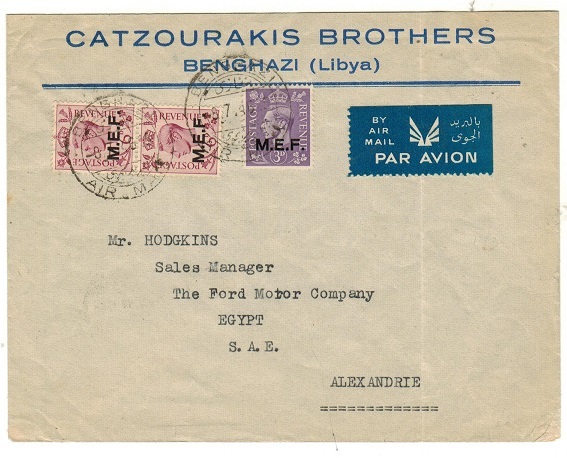 commercial 'Catzourakis Brothers' cover addressed to Egypt bearing MEF 3d and 6d (x2) tied by BENGHAZI/AIR MAIL cds's. 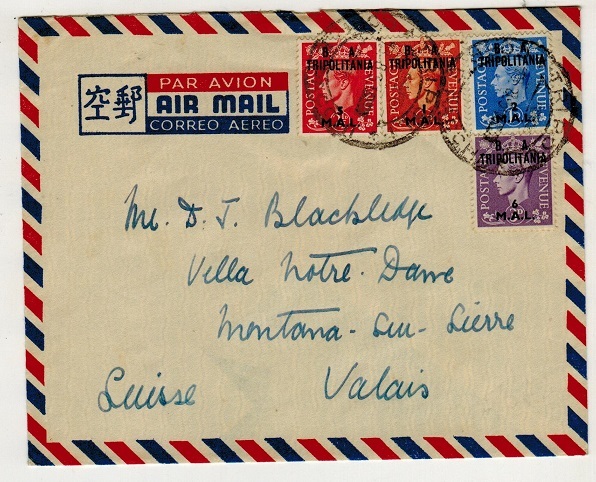 1/3d foreign letter air mail rate (20 grams). B.O.F.I.C. - 1944 CHRISTMAS GREETINGS postcard used by the military. 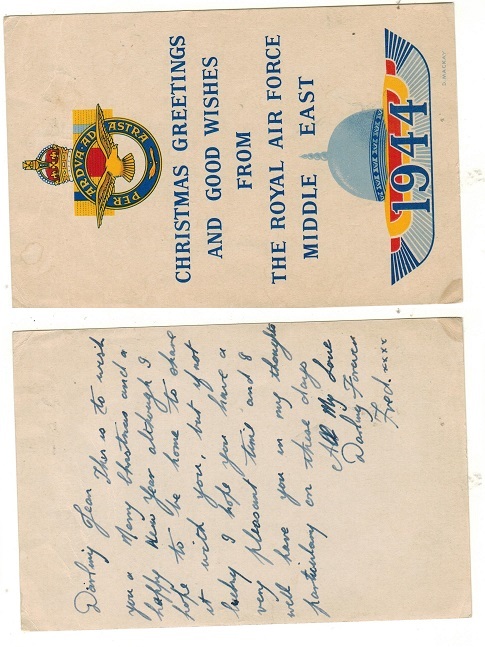 1944 blue red and yellow on cream CHRISTMAS GREETINGS FROM ROYAL AIR FORCE/MIDDLE EAST christmas card depicting air force logo with message on reverse side. B.O.F.I.C. 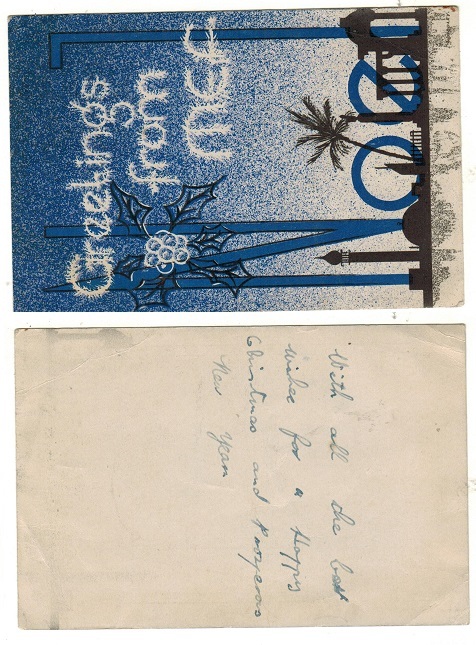 - 1945 GREETINGS FROM MEF postcard used by the military. 1945 blue and black on cream GREETINGS FROM MEF christmas card depicting silhouettes and decorations with small message on reverse side. 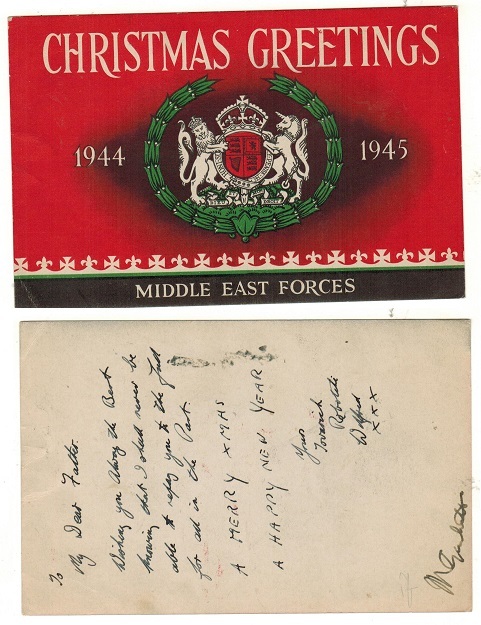 1944 CHRISTMAS GREETINGS/MIDDLE EAST FORCES postcard with message on reverse depicting Royal Coat of Arms. B.O.F.I.C. - 1943 XMAS GREETINGS postcard used by the Royal Air Force. 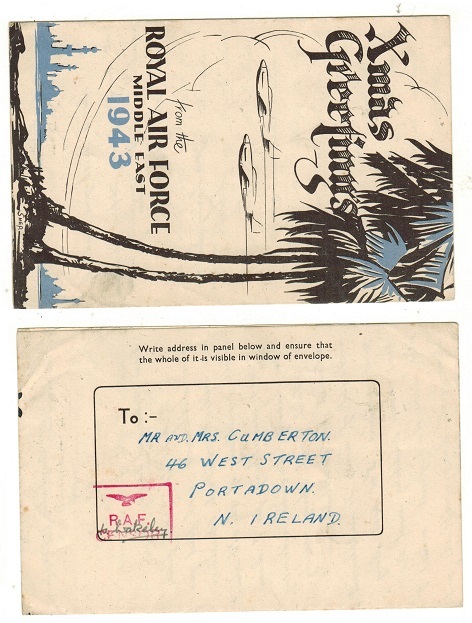 1943 ROYAL AIR FORCE-XMAS GREETINGS card addressed to Northern Ireland with red boxed RAF/CENSOR mark on reverse. Printed in blue and black on cream and designed by Shep' and issued to members stationed througout the Middle East. Examples are however rare to find. B.O.F.I.C. - 1943 GREETINGS postcard for use by the military. 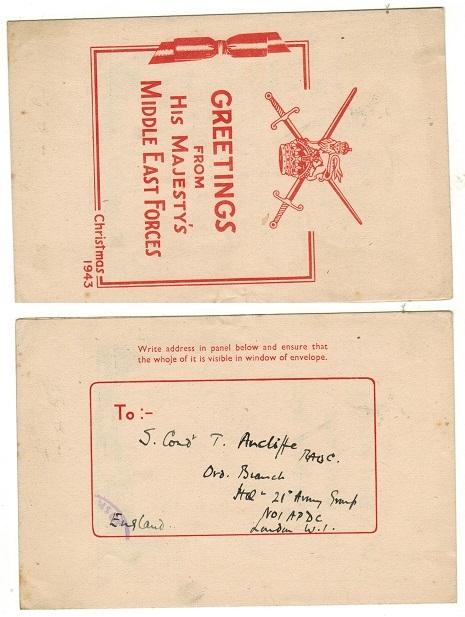 1943 red on cream creasted GREETINGS/FROM/HIS MAJESTY'S/MIDDLE EAST FORCES card addressed to London with part violet censor mark applied. Issued by the General Headquarters for use in the Middle east. B.O.F.I.C. 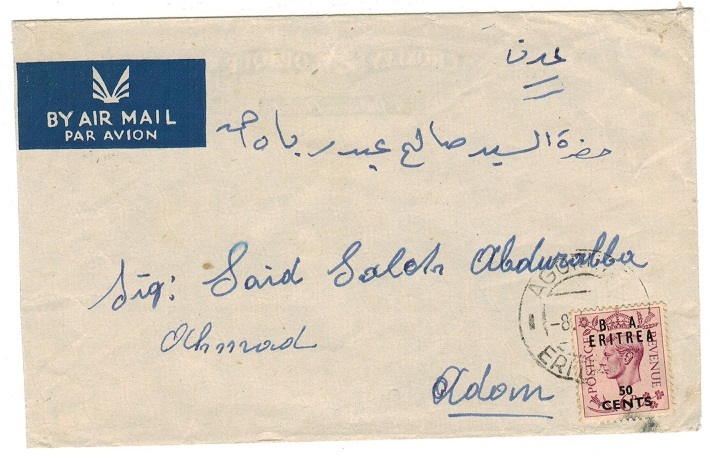 (Tripolitania) - 1951 12mal rate cover to UK used at TRIPOLI. 1951 (29.3.) 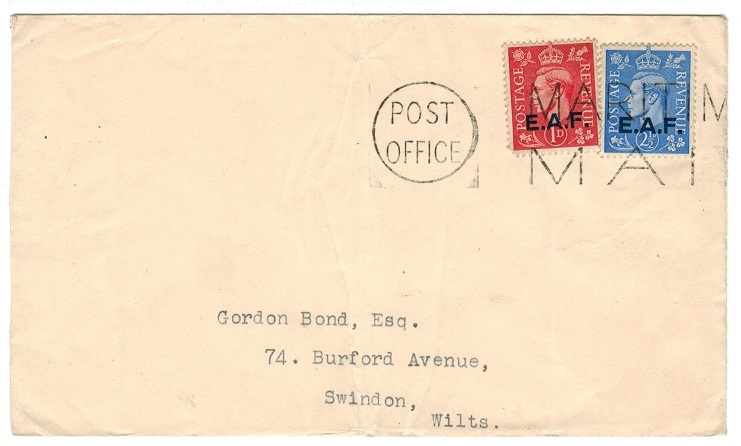 cover addressed to UK bearing 'B.A. 12 mal adhesive tied by TRIPOLI/CORR.E. PACCHI cds (GBOS type T5). B.O.F.I.C. (Tripolitania) - 1951 14mal rate cover to Switzerland used at TRIPOLI. 1951 (8.5.) 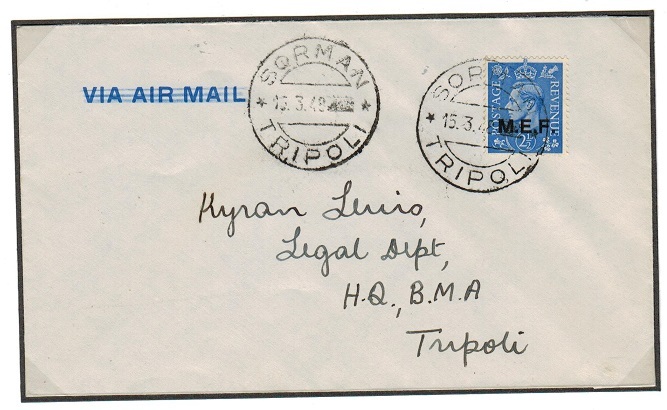 cover addressed to Switzerland bearing 1m,2m,5m and 6m adhesives making up the 14 mail rate tied TRIPOLI. B.O.F.I.C. 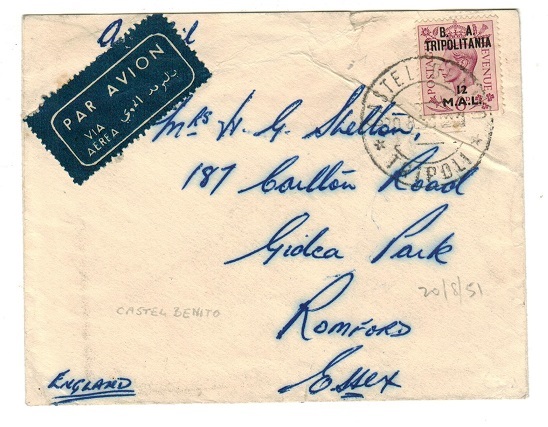 (Tripolitania) - 1951 12mal cover to UK used at TRIPOLI. 1951 (20.5.) 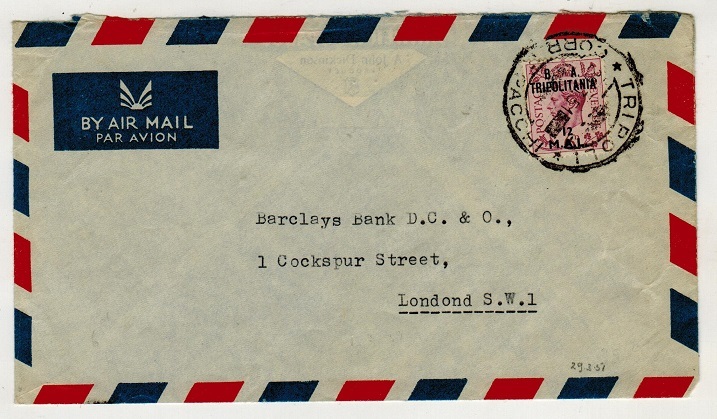 cover addressed to UK bearing 'B.A.' 2mal and 10mal adhesives tied by TRIPOLI cds (GBOS type T4) and struck by violet BY AIR MAIL h/s at left. B.O.F.I.C. 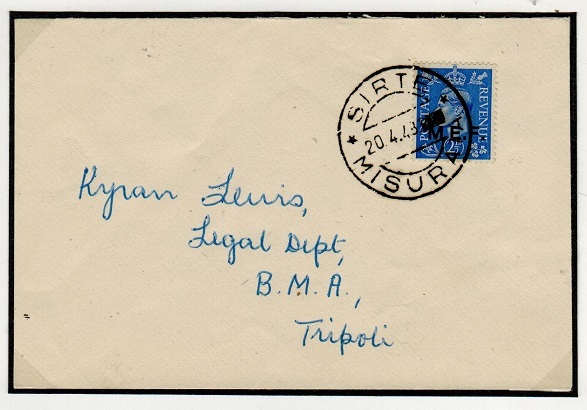 (Tripolitania) - 1951 12 mal rate cover to UK used at TRIPOLI. 1951 (17.12.) 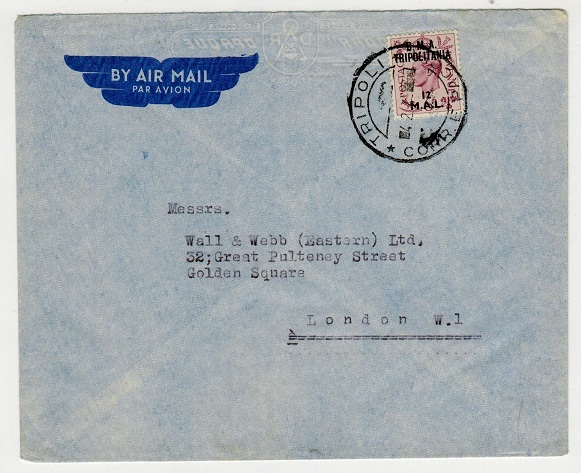 cover addressed to UK bearing 'B.A.' 2m,4m and 6m adhesives making up the 12 mal rate tied by TRIPOLI No.2 'sub' Post Office cds (GBOS type T14). 1951 (12.2.) cover addressed to UK (light horizontal fold) bearing 'B.A' 2mal and 10mal adhesives tied by TRIPOLI/CORR.E.PACCHI cds (GBOS type T5). B.O.F.I.C. (MEF) - 1942 1d scarlet mint se-tenant pair with ROUND/SQUARE STOPS. SG M6b. 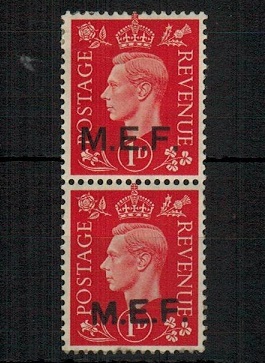 1942 1d scarlet in a fine mint vertical pair showing the ROUND STOP and SQUARED STOP variants SE-TENANT. SG M6b. B.O.F.I.C. (Eritrea) - 1942 unaddressed FDC with 'MEF' set used at ADI UGRI. 1942 (2.3.) 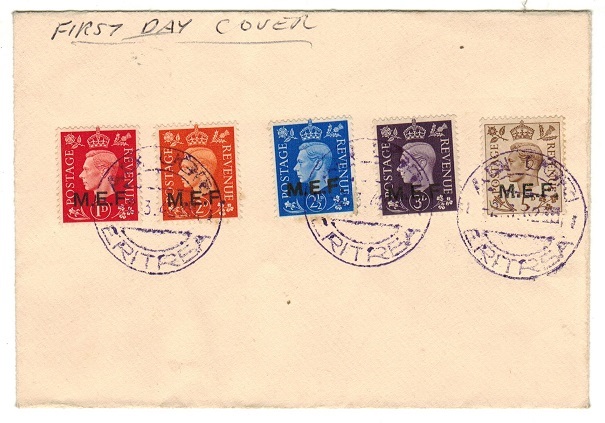 first day (unaddressed) cover bearing 1d-5d 'MEF' adhesives tied by scarce ADI UGRI/ERITREA cancels in violet ink. All dark colours with the 2 1/2d having the round stops. (SG M1,2,4,6 and M8a). B.O.F.I.C. 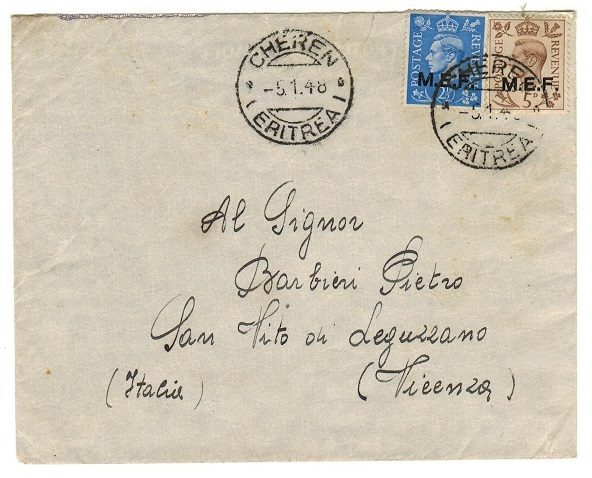 (Eritrea) - 1948 cover to Italy used at CHEREN. 1948 (5.1.) 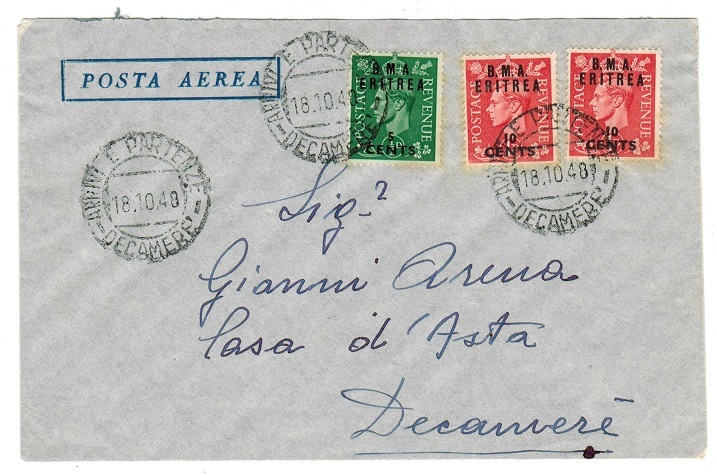 cover addressed to Italy bearing 2 1/2d and 5d 'MEF' adhesives tied by CHEREN/ ERITREA cds's. B.O.F.I.C. (Tripolitania) - 1951 5m rate local cover used at ZUARA CITTA. 1951 (21.9.) local Government cover bearing 5m on 2 1/2d 'B.A./Tripolitania' adhesive tied by ZUARA CITTA/TRIPOLI cds. Scarce strike. B.O.F.I.C. (Tripolitania) - 1948 2 1/2d rate local cover used at SIRTE/MISURATA. 1948 (20.4.) local cover addressed to Kyran Lewis bearing MEF 2 1/2d adhesive tied by SIRTE/ MISURATA cds used in the (Beni Ulid) Eastern District of Tripolitania (GBOS type T40). Lewis was believed to be a judge in the legal department of HQ.BMA at Tripoli who over saw the Post Offices and produced some of the rariest known village covers of Tripolitania. B.O.F.I.C. (Eritrea) - 1942 MEF set on unaddressed cover used at GHINDA with 2d 'Cairo' round stop. 1942 (2.4.) 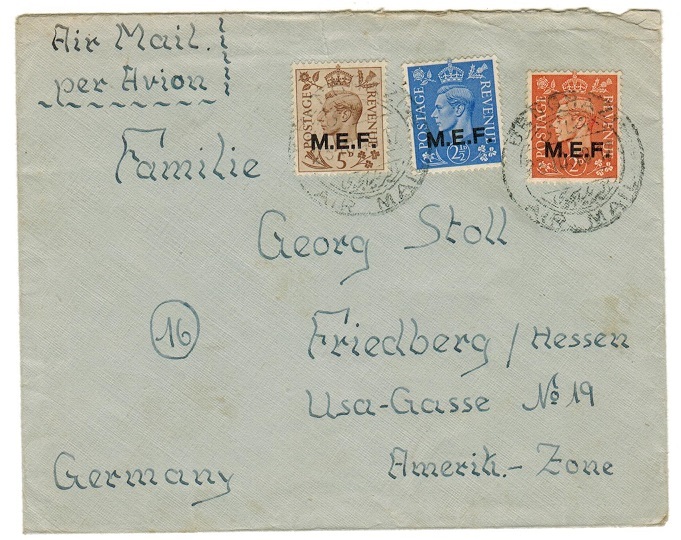 unaddressed cover bearing the 'MEF' dark coloured series (SG M1,3,4+5 - 14mm issues) but with the 2d orange being the scarce Cairo printing (SG M7a) with round stops 13 1/2mm all tied by individual GHINDA/ERITREA cds's. B.O.F.I.C. (Eritrea) - 1942 MEF set on FDC with 'Cairo' 1d+2d 'round stops' used at GHINDA. 1942 (2.3.) 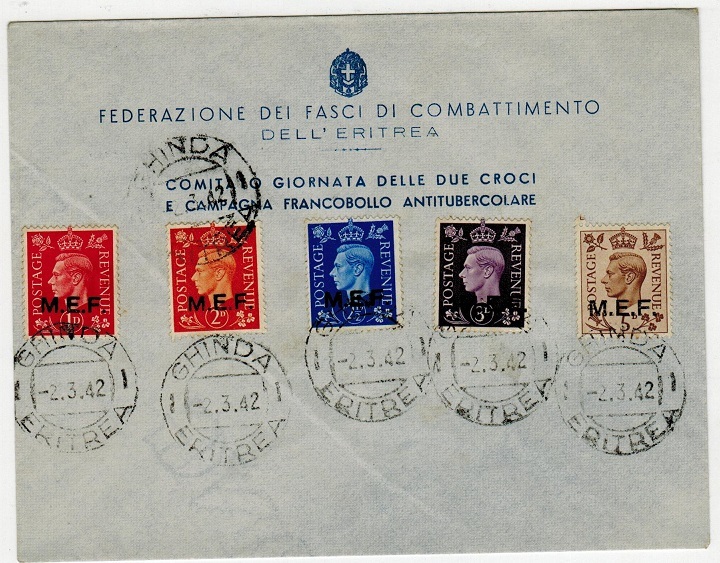 unaddressed first day cover on pre-printed 'Federazione Del Fasci Di Combattimento Dell Eritrea' cover bearing the 1942 'MEF' dark colour adhesives (SG M3-5) of the 14mm setting together with the scarce Cairo 'ROUND STOP' 1d and 2d adhesives of the 13 1/2mm setting (SG M6a and M7a) tied by individual GHINDA/ERITREA cds's. B.O.F.I.C. (Ethiopia) - 1942 GB 1d (x2) + 3d used on piece in Addis Ababa. 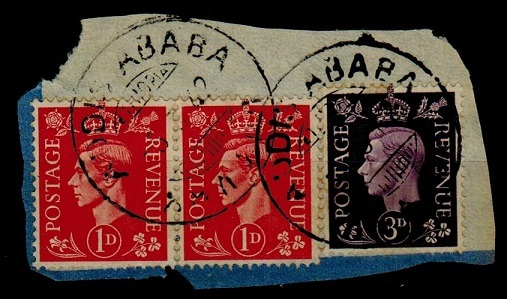 1942 use of 'GB' 1d red pair and 3d violet 'light colour' adhesives cancelled by rare ADDIS ABABA cds dated 5.3.42. Used by British Forces that occupied Addis Ababa from April 5th 1941 until March 23rd. B.O.F.I.C. (Tripolitania) - 1951 12mal rate cover to UK used at CASTEL BENITO. 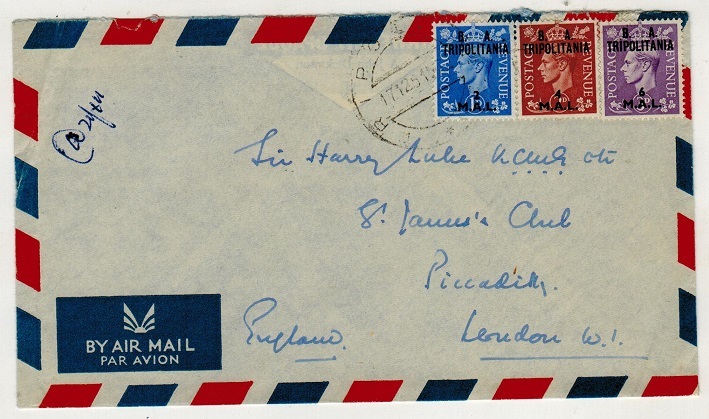 1951 (20.8) cover to UK bearing 'B.A.Tripolitania; 12mal on 6d adhesive tied by (bridge type)CASTEL BENITO cds. (Surface buckle at top right but does not affect the stamp). B.O.F.I.C. (Tripolitania) - 1945 5d rate local cover used at NALUT. 1945 (JU.30.) 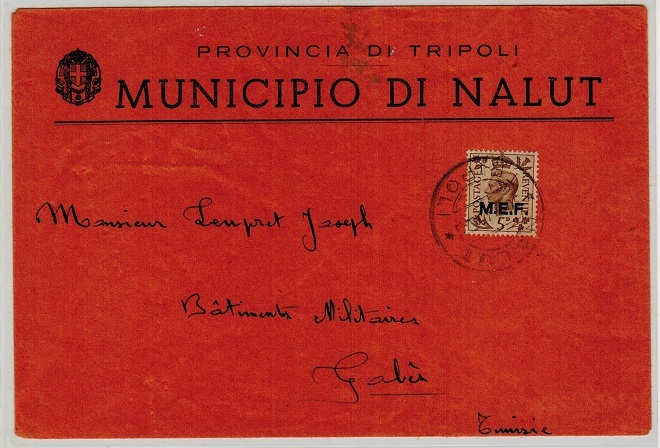 pre-printed 'Provincia Di Tripoli/Municipipo Di Nalut' envelope addressed to Tunisia bearing 5d 'M.E.F.' adhesive tied by scarce NALUT/TRIPOLI cds. GABES/TUNSIE arrival b/s. B.O.F.I.C. 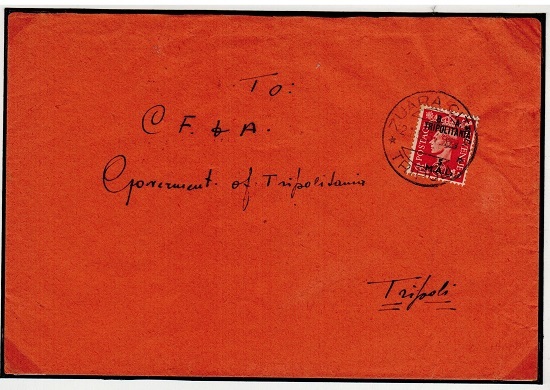 (Tripolitania) - 1946 1/3d rate cover to India used at TRIPOLI. 1946 (2.5.) 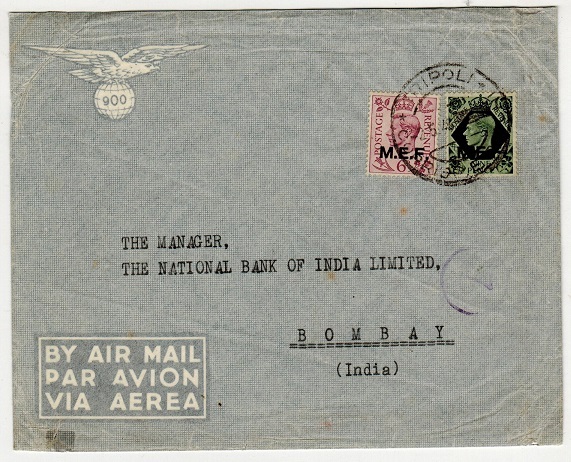 cover addressed to Bombay in India bearing MEF 6d and 9d adhesives making up the 1/3d letter rate cancelled by TRIPOLI/CORRISP.E.PACCHI cds and struck by violet circular '7' h/s denoting the cover was free of censorship. B.O.F.I.C. (Tripolitania) - 1946 1/8d rate registered cover to UK used at TRIPOLI. 1946 (16.12.) 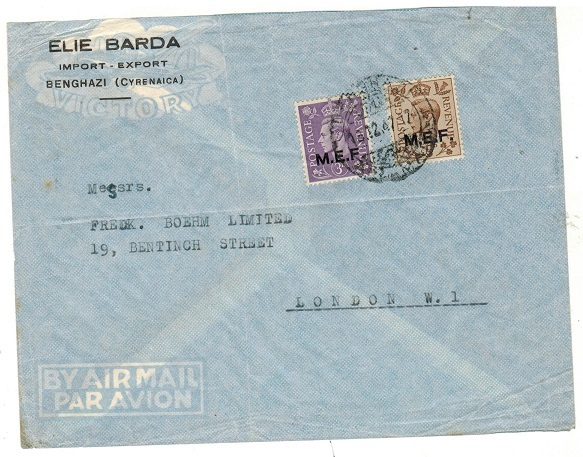 registered cover addressed to UK bearing MEF 5d,6d and 9d adhesives paying the 1/8d rate cancelled by TRIPOLI cds (GBOS type T1) with black boxed PER VIA AEREA/PAR AVION h/s and violet ringed '7' censor mark to indicate it was free from censorship. B.O.F.I.C. (Tripolitania) - 1948 6d rate cover to UK used at TRIPOLI. 1948 (22.6.) 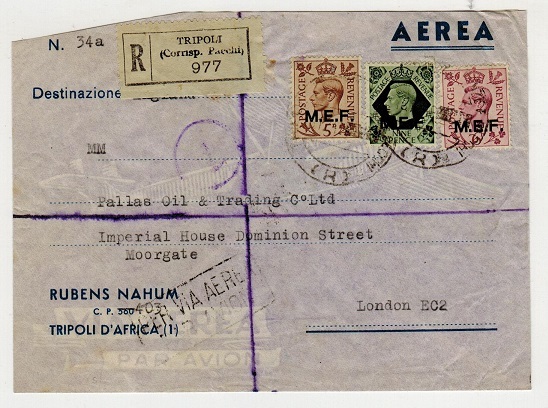 cover addressed to UK marked 'Via Calabria No.15-Tripoli' with typed 'AEREA' alongside bearing MEF 2d strip of three tied TRIPOLI/CORRIS.E.PACCHI cds. B.O.F.I.C. 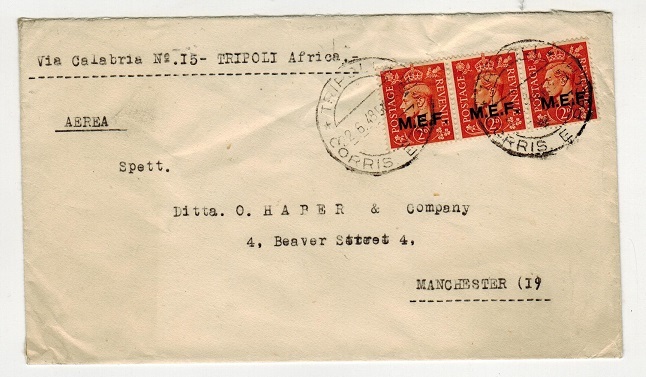 (Tripolitania) - 1949 12 mail rate cover to UK used at TRIPOLI. 1949 (4.2.) 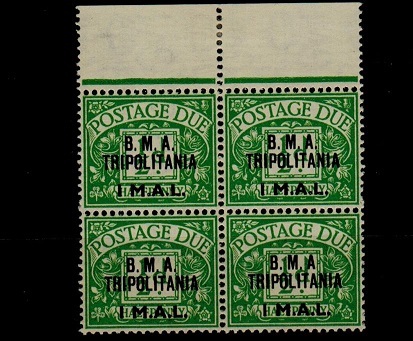 cover addressed to UK bearing 'BMA' 12mal adhesive tied by TRIPOLI/CORRIS.E. PACCHI cds (GBOS type T10). B.O.F.I.C. (Tripolitania) - 1950 18 mal rate cover to UK. 1950 (29.3.) 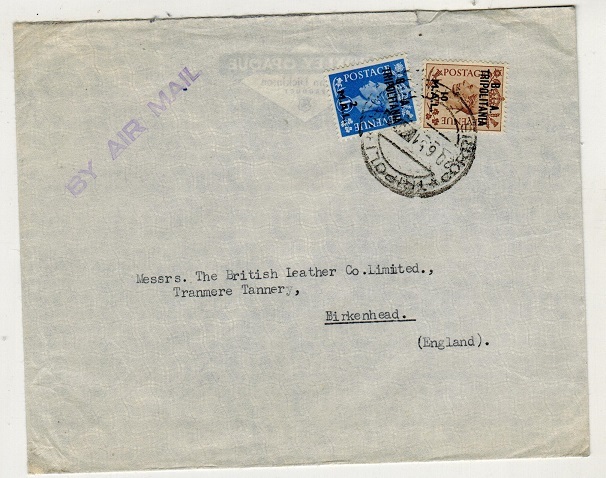 cover addressed to UK bearing 'B.A.' 18 mal adhesive tied by TRIPOLI/CORRIS.E. PACCHI ('R') cds (GBOS type T4) used normally for packets and parcels. B.O.F.I.C. 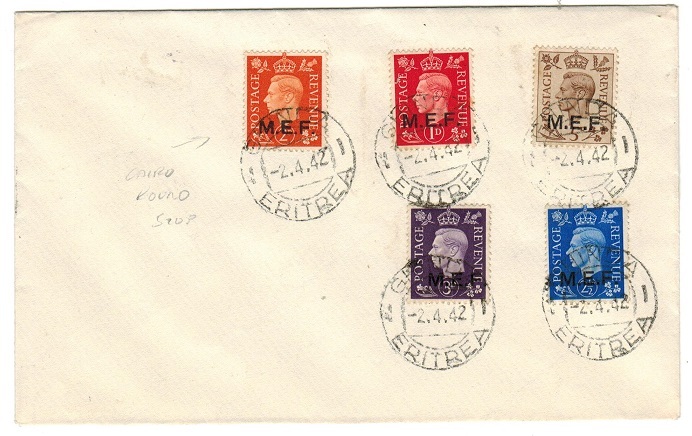 (MEF) - 1949 range of five unaddressed covers bearing MEF postage due series. 1949 (FEB.7.) 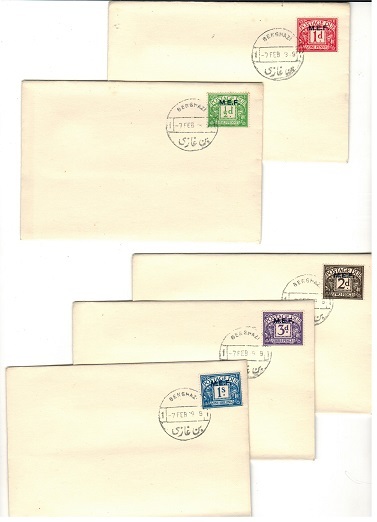 range of five unaddressed philatelic envelopes each bearing one of the MEF 'Postage Dues' completing the series SG MD1-5 each tied by BENGHAZI bilingual cds. B.O.F.I.C. (Somalia) - 1948 40c on 5d CYLINDER L/42 plate 3 block of six. SG S15. 1948 40c on 5d brown unmounted mint CYLINDER L/42 Plate 3 (no stop) corner marginal block of six overprinted B.M.A.SOMALIA. SG S15. B.O.F.I.C. (Tripolitania) - 1948 2 1/2d rate local cover cancelled by SORMAN cds. 1948 (15.3.) cover addressed locally to K.Lewis at HQ BMA in Tripoli bearing MEF 2 1/2d tied by rare SORMAN/TRIPOLI cds's with additional strike at left. One of Tripoli's most elusive cancels. B.O.F.I.C. (Eritrea) - 1943 (circa) 5c black surcharged INLAND/REVENUE issue U/M. 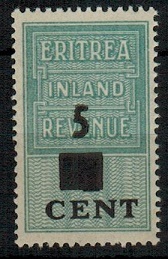 1943 (circa) 5c black surcharge on turquoise ERITREA/INLAND/REVENUE adhesive in fine unmounted mint condition. B.O.F.I.C. (Somalia) - 1942 (circa) 3d green RPSE of GB overprinted E.A.F. used. 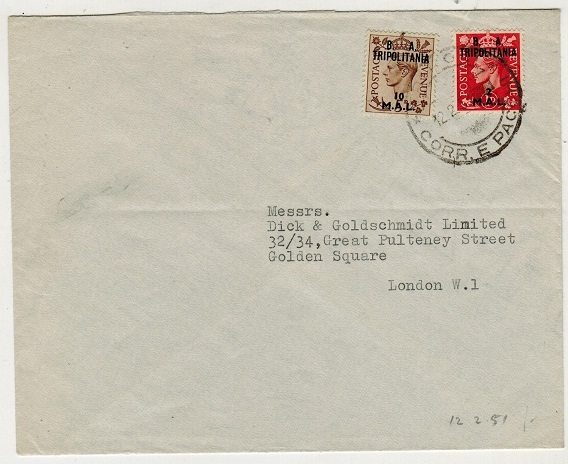 1939 3d green 'Military & Occupation' 'KGVI' GB registered postal stationery envelope (size G) overprinted 'E.A.F.' in black with 'Compensation' on reverse having the reference to registration and address omitted and showing only FEE PAID in bottom left corner and with '£5' on reverse side corrected my block and '2' h/s. The envelope is addressed to Switzerland and has EAF 2d,3d and 1/- overprinted adhesives added and tied by scarce MOGADISHU/C cds. 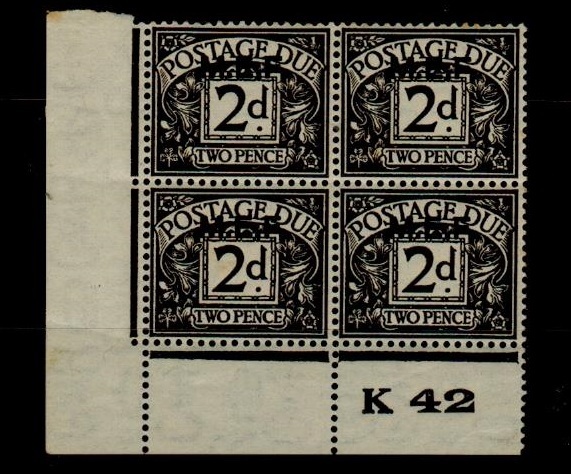 GB type H&G 2a overprinted. A very scarce piece of stationery so used. B.O.F.I.C. (Somalia) - 1942 40c on 5 1/2d brown RPSE (size F) unused. 1942 (circa) 40c black on 5 1/2d brown on buff 'GB' registered postal stationery envelope (size F) in fine unused condition additionally overprinted B.M.A./SOMALIA. 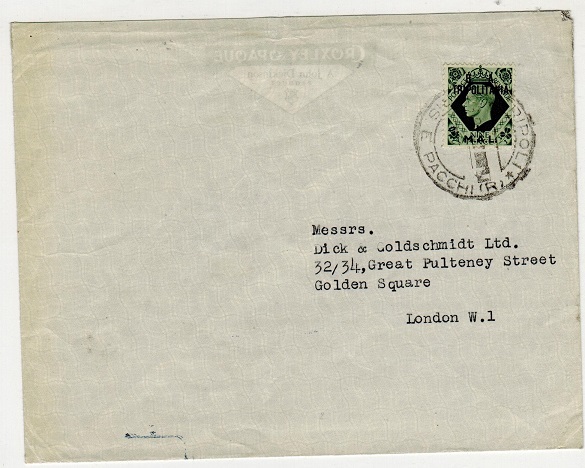 A very rare 'McCorquodale & Co Ltd' stationery envelope. (Huggins RP66). B.O.F.I.C. (Eritrea) - 1948 20c on 2d agate mint with MISSING STOP AFTER A. SG ED3a. 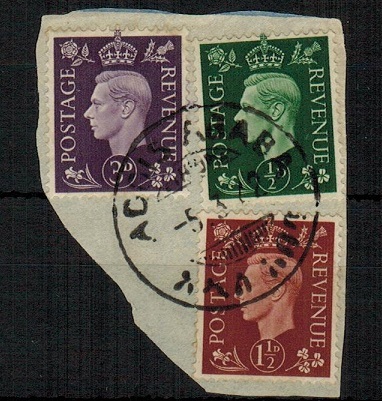 1948 20c on 2d agate 'Postage Due' in fine mint condition showing the MISSING STOP AFTER A variety. SG ED3a. B.O.F.I.C. (Ethiopia) - 1937 'GB' 1/2d (x3) and 2 1/2d tied ADDIS ABABA on piece. 1937 'GB' dark colours 1/2d green adhesive strip of three with 2 1/2d blue tied to piece by rare ADDIS ABABA cds dated 7.3.42. Used by British Forces that occupied Addis Ababa from April 5th 1941 until March 23rd 1942. Listed by B&K catalogue but unpriced. B.O.F.I.C. (Ethiopia) - 1937 'GB' 1/2d, 1 1/2d and 3d tied ADDIS ABABA on piece. 1937 'GB' dark colours 1/2d, 1 1/2d, and 3d adhesives tied to small piece by rare ADDIS ABABA cds dated 7.3.42. Used by British Forces that occupied Addis Ababa from April 5th 1941 until March 23rd 1942. Listed by B&K catalogue but unpriced. B.O.F.I.C. (Ethiopia) - 1937 'GB' 1d pair and 3d tied ADDIS ABABA on piece. 1937 'GB' dark colour 3d violet tied with 1d light colour adhesive pair to small piece by ADDIS ABABA cds dated 5.3.42. Used by British Forces that occupied Addis Ababa from April 5th 1941 until March 23rd 1942. Listed by B&K catalogue but unpriced. B.O.F.I.C. (Ethiopia) - 1937 'GB' 2 1/2d pair tied ADDIS ABABA on piece. 1937 'GB' dark colour 2 1/2d blue adhesive pair tied to small piece by rare ADDIS ABABA cds dated 7.3.42. Used by British Forces that occupied Addis Ababa from April 5th 1941 until March 1942. Listed by B&K catalogue but unpriced. B.O.F.I.C. (Cyrenaica) - 1948 cover to Germany used at BENGHAZI. 1948 (23.10.) 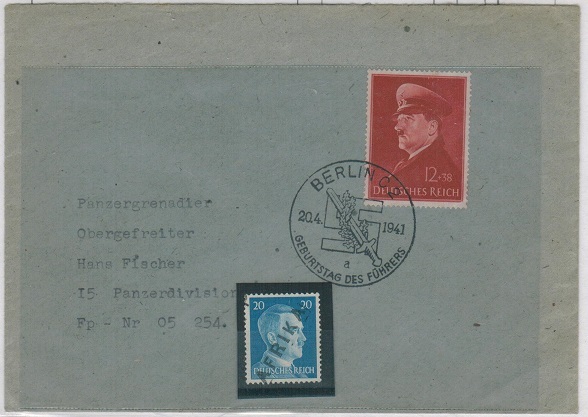 cover addressed to the American Zone in Berlin, Germany bearing MEF 2d, 2 1/2d and 5d adhesives tied by BENGHAZI/AIR MAIL cds's. B.O.F.I.C. 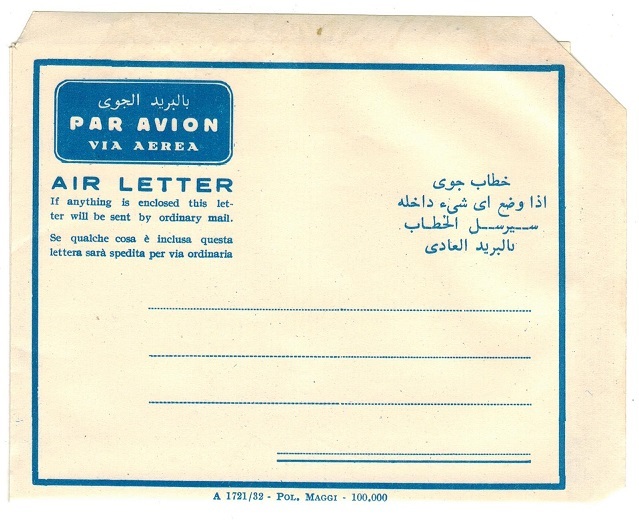 (Tripolitania) - 1951 FORMULA unused air letter on horizontal laid paper. 1951 dark blue on cream 'dual language' FORMULA postal stationery air letter in fine unused condition printed on rough (horizontal) laid paper and showing the A 1721/32-Pol.Maggi-10,000 imprint. Fine and scarce. B.O.F.I.C. 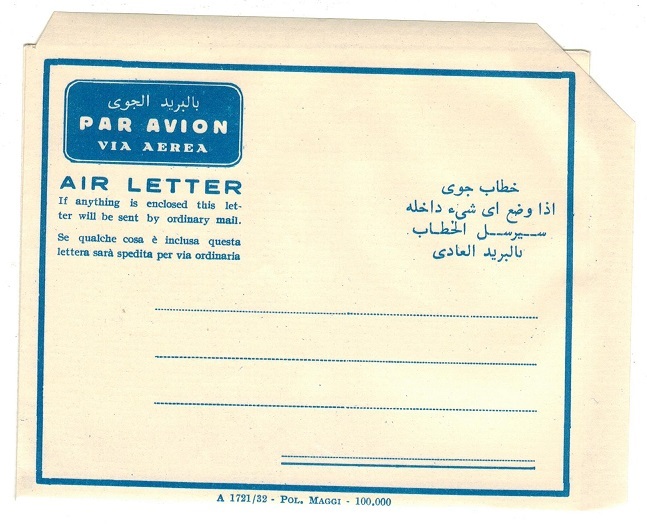 (Tripolitania) - 1951 FORMULA unused air letter on vertical laid paper. 1951 dark blue on cream 'dual language' FORMULA postal stationery air letter in fine unused condition printed on rough (vertical) laid paper and showing the A 1721/32-Pol.Maggi-10,000 imprint. Fine and scarce. B.O.F.I.C. - 1951 FORMULA air letter unused with 51-5829 imprint. 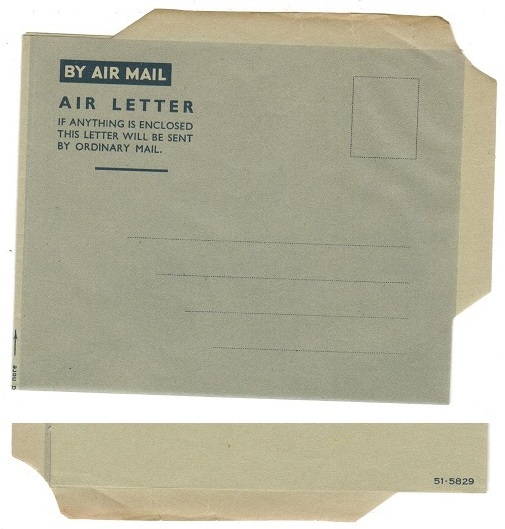 1951 dark blue on greyish FORUMLA air letter in fine unused condition showing the 51-5829 imprint at lower left edge. B.O.F.I.C. (Tripolitania) - 1943 censored cover to Egypt. 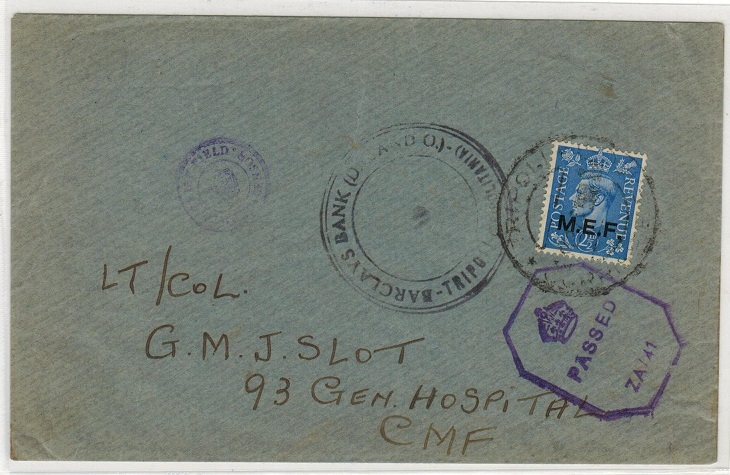 1943 cover addressed to the General Hospital/CMF (in Egypt) bearing 2 1/2d MEF adhesive tied by TRIPOLI cds with violet crowned PASSED/ ZA/41 h/s applied and with violet crowned DEPUTY FIELD CENSOR strike applied on arrival. B.O.F.I.C. 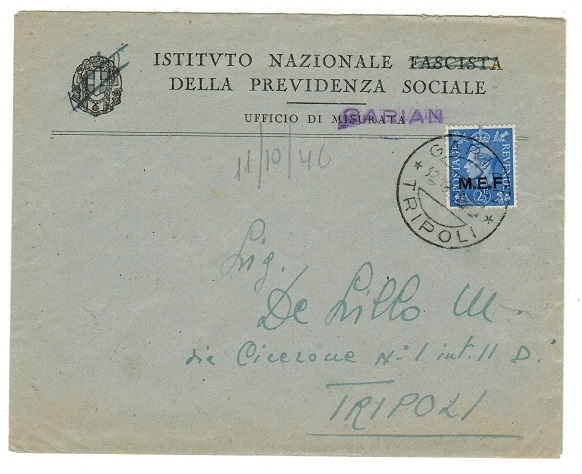 (Tripolitania) - 1946 local cover used at GARIAN. 1946 (12.10.) commercial cover addressed locally bearing 2 1/2d 'MEF' adhesive tied by GARIAN/TRIPOLI cds with violet GARIAN straight lined h/s above. Complete with original contents. B.O.F.I.C. 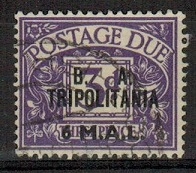 (Tripolitania) - 1950 6l on 3d violet 'postage due' used. SG TD9. 1950 6l on 3d violet 'B.A.Tripolitania' postage due in fine used condition. SG TD9. B.O.F.I.C. (Tripolitania) - 1950 4l on 2d agate 'postage due' used. SG TD8. 1950 4l on 2d agate 'B.A.Tripolitania' postage due in fine used condition. SG TD8. B.O.F.I.C. 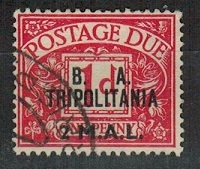 (Tripolitania) - 1950 2l on 1d carmine 'postage due' used. SG TD7. 1950 2l on 1d carmine 'B.A.Tripolitania' postage due in fine used condition. SG TD7. B.O.F.I.C. (Somalia) - 1940 1d + 2 1/2d 'EAF' stamps on MARITIME MAIL cover to UK. 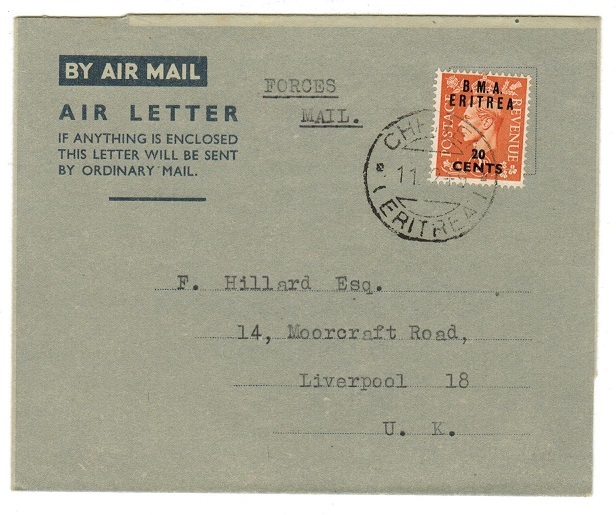 1940 (circa) cover addressed to UK (central fold) bearing 1d and 2 1/2d adhesives of GB overprinted 'E.A.F.' 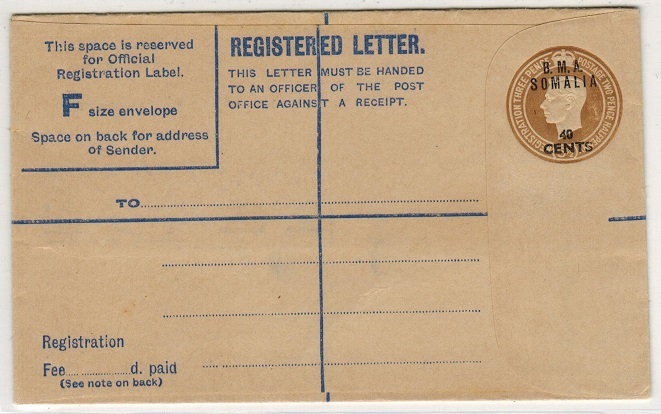 (SG S1+S2) as used by the British troops in occupied Somalia and cancelled by POST OFFICE/MARITIME MAIL cancel. Unusual. B.O.F.I.C. (Tripolitania) - 1948 1m on 1/2d U/M block of four with NO STOP variety. 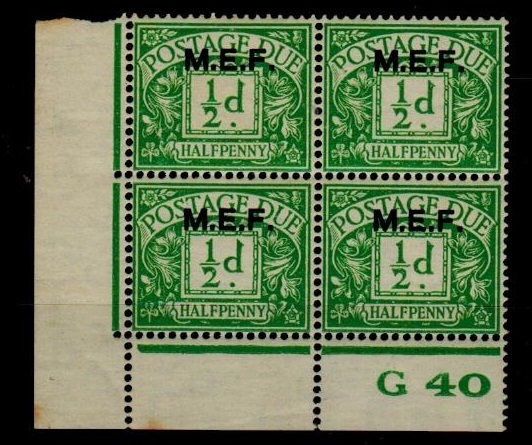 1948 1mal on 1/2d green 'BMA' postage due in a fine top marginal unmounted mint block of four showing the NO STOP AFTER A variety from Row 2/3. SG TD1a. B.O.F.I.C. 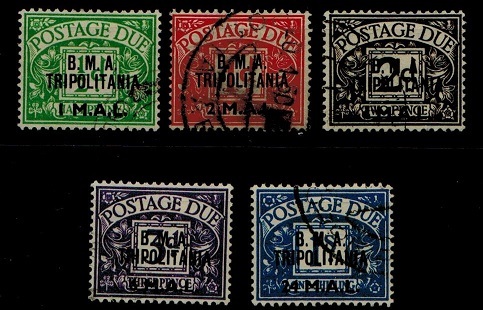 (Tripolitania) - 1948 2m on 1d U/M block of four with NO STOP variety. 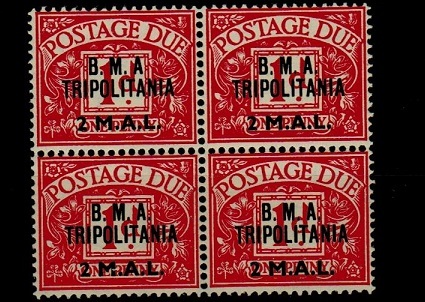 1948 2mal on 1d carmine 'BMA' postage due in an unmounted mint block of four showing the NO STOP AFTER A variety. SG TD2a. B.O.F.I.C. (Tripolitania) - 1948 4m on 2d fine mint with NO STOP variety. SG TD3b. 1948 4mal on 2d agate 'BMA' postage due in a fine lightly mounted mint marginal block of four showing the NO STOP AFTER M variety from Row 1/17. SG TD3b. B.O.F.I.C. 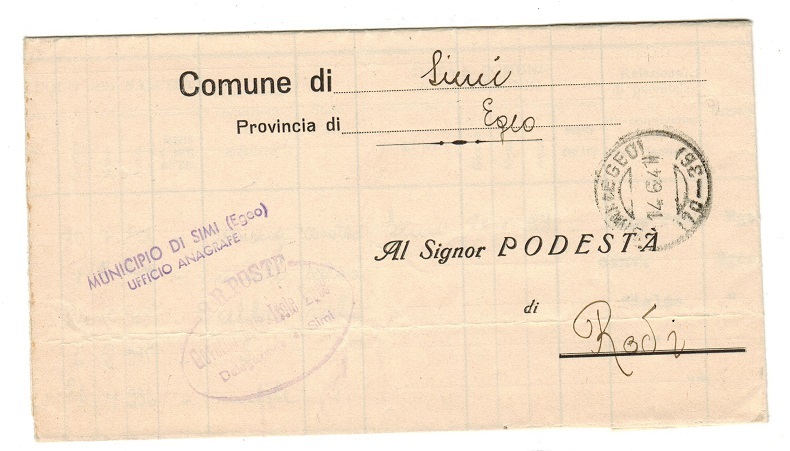 (Italian Occupation-DODECANESE) - 1941 stampless entire used at SIMI. 1941 (14.6.) official stampless 'Municipio Di Simi' letter sheet addressed to Rodi cancelled by SIMI EGEO cds with RODI/EGO arrival b/s. Violet oval R.R.POSTE strike on front. B.O.F.I.C. 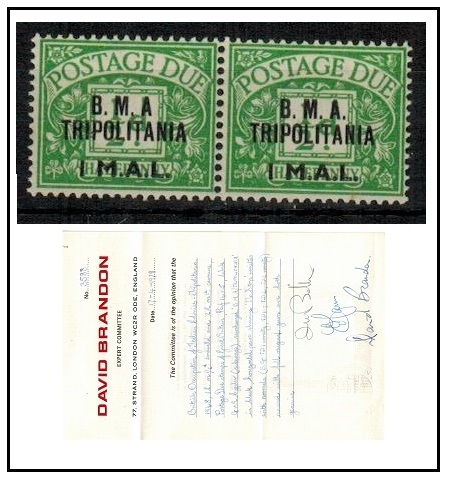 (Tripolitania) - 1949 'BMA' postage dues used. SG TD1-TD5. 1950 'British Administration' postage due series of five in fine used condition. A rare set since these stamps were withdrawn on December 23rd 1951 and hence had a very short life. SG TD6-TD10. B.O.F.I.C. 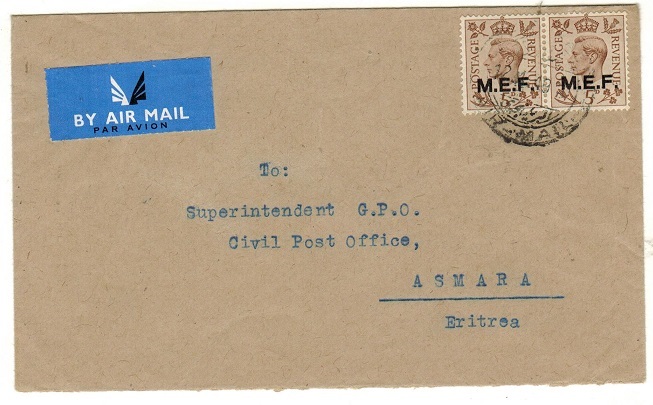 (Eritrea) - 1949 use of FORMULA air letter to UK used at CHEREN. 1949 (11.2.) 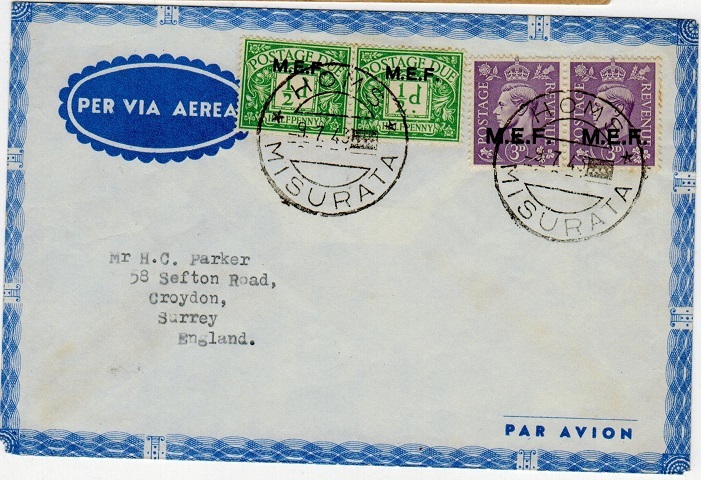 use of dark blue grey on grey air letter addressed to UK (no message) marked 'Forces Mail' and bearing BMA 20c on 2d adhesive tied CHEREN/ERITREA. B.O.F.I.C. (Tripolitania) - 1943 cover to UK with postage dues used at HOMS. 1943 (9.7.) 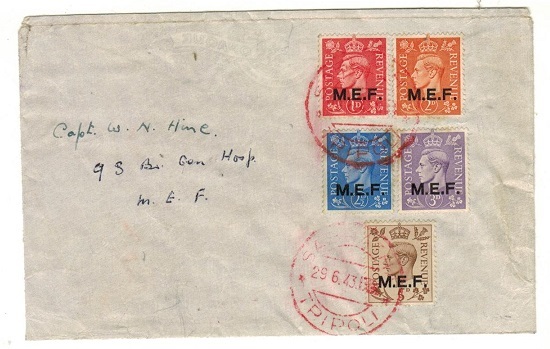 unaddressed airmail cover bearing 3d violet 'MEF' light coloured adhesive pair with MEF 1/2d 'Postage Due' pair alongside cancelled HOMS/MISURATA cds. (GBOS type T38). B.O.F.I.C. (Eritrea) - 1950 local GIORMATA FILATELICA cover with Xmas label. 1950 (25.6.) local cover addressed to Asmara (vertical fold) bearing the 'B.A.Eritrea' 2sch.50c on 2/6d green adhesive tied alongside the dark blue and purple perforated 'Comitato Italiano Onoranze Cadvti/Sietesehpre Con Noi'/Asmara 1950' christmas label tied by GIORNATA FILATELICA DELL ERITREA/ASMARA exhibition cds's. Numbered 1606 at bottom. 1950 (25.6.) 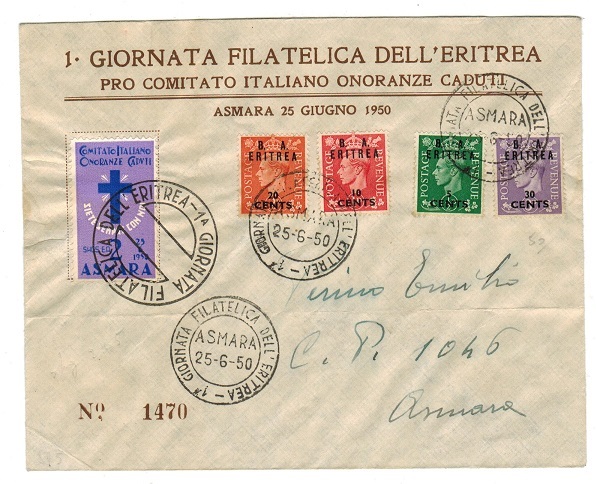 local cover addressed to Asmara (vertical fold) bearing the 'B.A.Eritrea' 5c,10c, 20c and 30c adhesives tied alongside the dark blue and purple perforated 'Comitato Italiano Onoranze Cadvti/Sietesehpre Con Noi'/Asmara 1950' christmas label tied by GIORNATA FILATELICA DELL ERITREA/ASMARA exhibition cds's. Numbered 1470 at bottom. B.O.F.I.C. (Eritrea) - 1948 postcard used locally from SENAFE. 1948 (1.6.) 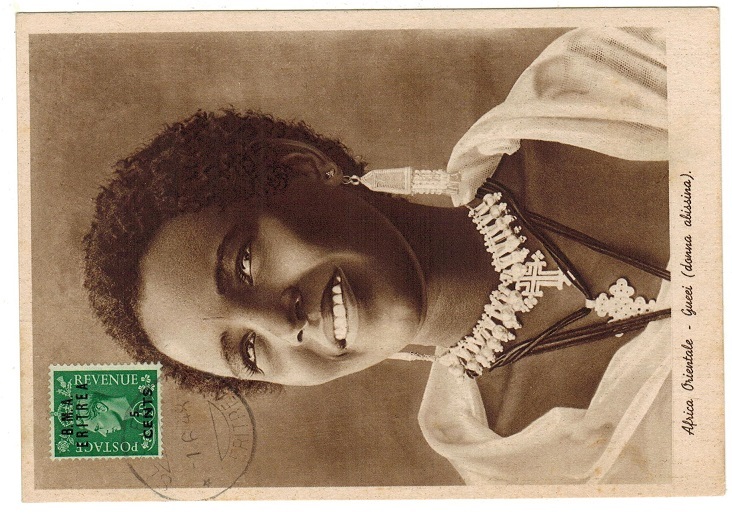 use of picture postcard (philatelic local use-no message) depicting 'Africa Orientale' (local girl) bearing 'BMA Eritrea' 5c on 1/2d adhesive tied to the front by SENAFE/ERITREA cds (GBOS type E41-scarce) and with ADI CAIE b/s. B.O.F.I.C. (Eritrea) - 1948 local cover used at DECAMERE. 1948 (18.10.) cover addressed locally bearing 'BMA Eritrea' 5c on 1/2d and 10c on 1d (x2) adhesives tied by d/r ARRIVI E PARTENZE/DECAMERE cds. (GBOS type E25). B.O.F.I.C. (Eritrea) - 1950 cover to Aden used at AGORDAT. 1950 (8.MY.) cover addressed to Aden bearing 'B.A.Eritrea' 50c on 6d adhesive tied by AGORDAT/ERITREA cds. B.O.F.I.C. (Somalia) - 1949 cover to USA used at BRAVA/SOMALIA. 1949 (JA.1.) 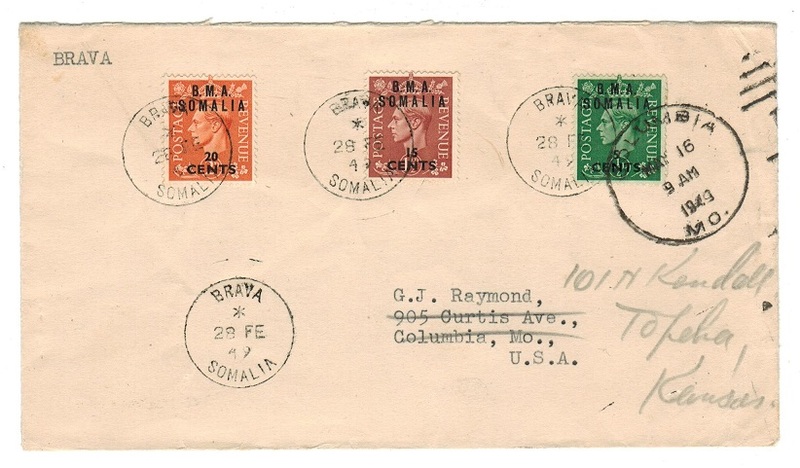 cover addressed to USA bearing 5c/ 1/2d, 15c/1 1/2d and 20c /2d 'BMA/SOMALIA' adhesives each tied by BRAVA/SOMALIA cds with COLUMBIA arrival at right. B.O.F.I.C. (Eritrea) - 1942 censored military cover with 'MEF' 2 1/2d (x6). 1942 (12.11.) 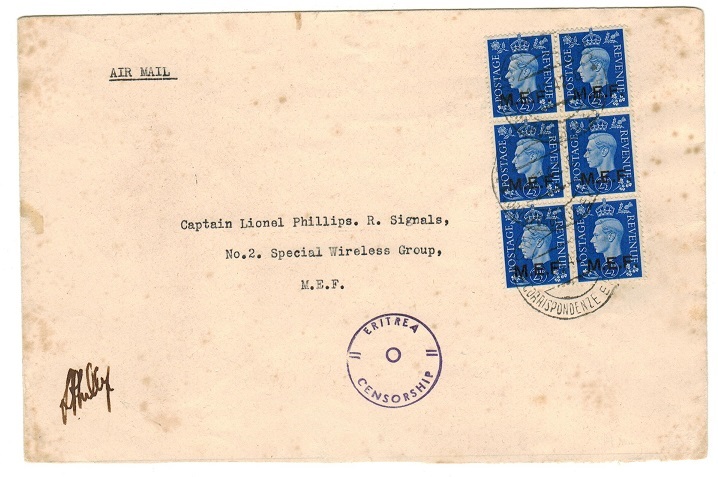 military cover addressed to Capt Phillips of the 'Special Wireless Group' (some light tone spots) bearing a block of six of the 'MEF' 2 1/2d adhesive tied by ASMARA FERROVIA/ARRIVI PARTENZE cds with FPO/90 b/s and struck on the front by violet ERITREA/CENSORSHIP strike in violet. A scarce early cover. B.O.F.I.C. (Somalia) - 1948 'Forces' cover to UK used at MOGADISHU. 1948 (FE.19.) 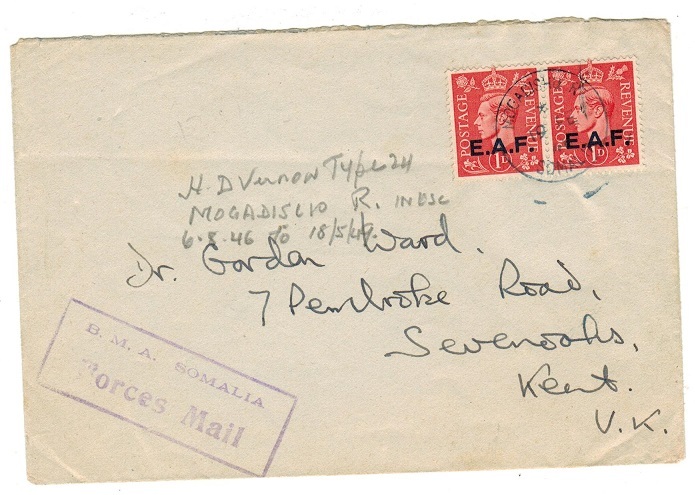 cover addressed to UK bearing 'EAF' 1d pair tied by 'blue' MOGADISHU R/ SOMALIA cds with violet boxed B.M.A.SOMALIA/FORCES MAIL handstamp at lower left. B.O.F.I.C. (Ethiopia) - 1937 GB 1d strip of four used at ADDIS ABABA. 1937 'GB' 1d scarlet 'light colour' adhesive strip of four cancelled by rare ADDIS ABABA cds dated 12.3.42. Used by British Forces that occupied Addis Ababa from April 5th 1941 until March 23rd 1942. Listed by B&K catalogue but unpriced. Genuine multiple use of this 1d being most elusive. B.O.F.I.C. (Ethiopia) - 1937 GB 1/2d strip of three used at ADDIS ABABA. 1937 'GB' 1/2d green 'dark colour' adhesive strip of three cancelled by rare ADDIS ABABA cds dated 7.3.42. Used by British Forces that occupied Addis Ababa from April 5th 1941 until March 23rd 1942. Listed by B&K catalogue but unpriced. Genuine multiple use of this 1/2d being most elusive. B.O.F.I.C. (Tripolitania) - 1951 set of 8 U/M. SG T27-T34. 1951 series of eight in unmounted mint condition. SG T27-T34.